The Washington Capitals have re-signed center Nic Dowd to a three-year contract extension, senior vice president and general manager Brian MacLellan announced today. Dowd’s contract will carry an average annual value of $750,000. Dowd, 28, set a career high with eight goals this season and tied his single-season high with 22 points (8g, 14a). 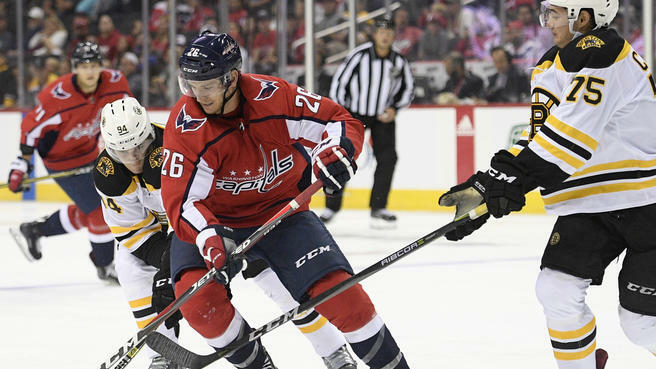 The native of Huntsville, Alabama, ranked fourth among Capitals’ forwards with at least 60 games played in penalty kill minutes per game (1:39). Additionally, the 6’2”, 197-pound center recorded a career-high three game-winning goals, including the playoff-clinching game-winner on March 28 versus the Carolina Hurricanes and the Metropolitan Division-clinching goal on April 4 against the Montreal Canadiens. Dowd also ranked first on the Capitals in face-off percentage among players with at least 100 draws taken (245 of 472, 51.9 percent). In 195 career NHL games, Dowd has 48 points (17g, 31a). Dowd attended St. Cloud State University (NCAA), serving as captain in his senior year. Dowd recorded 40 points (22g, 18a) in 38 games during his senior season and finished as a Hobey Baker finalist as the NCAA’s top player in 2014. The Capitals signed Dowd to a one-year, $650,000 contract on July 1, 2018. MacLellan: Gives this man a 3 year extension!